As you read this week’s psalm, listen for themes that resonate with the story of Jesus’ entrance into Jerusalem and the passion story that follows. Blessed is the one who comes in the name of the LORD. We bless you from the house of the LORD. The LORD is God, and he has given us light. Bind the festal procession with branches, up to the horns of the altar. You are my God, and I will give thanks to you; you are my God, I will extol you. The story of Holy Week will be a painful one, and yet in the face of this pain the psalm affirms the goodness of the Lord and God’s “steadfast love that endures forever.” This day to which we awoke, this morning has been made by God and calls for rejoicing and thanksgiving. 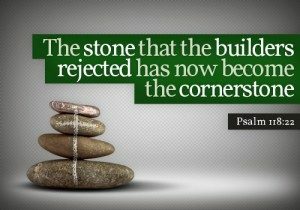 Jesus must enter “the gate of the Lord”, and for him that means the gate of the city Jerusalem where he will be the “stone that is rejected.” But the rejected cornerstone will ultimately be the cornerstone of a new creation. The story invites us to trust in the ultimate triumph of love. “The LORD is God, and he has given us light. “His steadfast love endures forever,” and we are in that love for eternity, and in this trust we find the courage to follow Jesus in this procession to the cross, and through every dark valley life calls us to pass through.